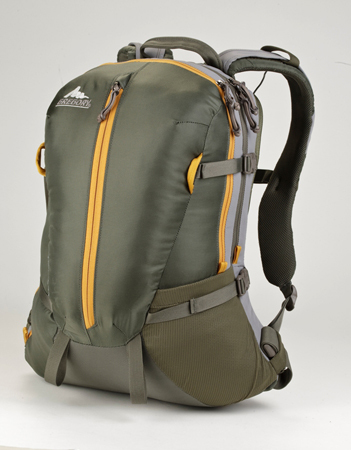 With a little bit of something for everyone, the Muir 24 is marketed as a “go-anywhere, do-anything” daypack. While that may be a bold statement, the Muir has a bevy of features to appeal to the outdoors and urban markets. It has 24 liters (1,464 cubic inches) of capacity — enough for school books and a computer or supplies during a day hike in the mountains. There is a padded hydration sleeve that doubles as a laptop sleeve, a hydration port that doubles as an earphone-cord port, and a hip belt that tucks away when you don’t need it while “hiking” around campus or in town. The crossover features keep coming, including compression straps to allow you to carry a snowboard; ice axe and trekking pole loops; interior organizational pockets; an easy-access front zipper pocket; large zippered compartments; and a reinforced ballistic nylon bottom panel. The pack comes in a men’s and a women’s model (women’s called the Imlay 22). Despite all the extras, Gregory specs the packs to weigh just 1.5 pounds when empty.